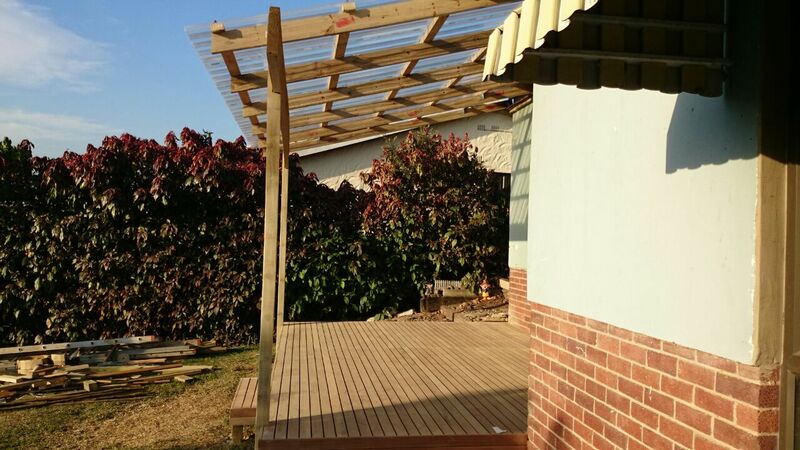 Here’s a steel and timber pergola we installed shortly before shut down in 2015 in Gateway Umhlanga Rocks Durban. It was for a new building called 1 on Lunar neat Gateway Hospital. Due to the size of the pergola and the distance the beams needed to span between supports, we needed to include steel as the largest solid timber piece one can purchase is a 50 x 228 which needs to be supported every 3m odd to stop it sagging in the middle. Thicker wider pieces are available in laminated pine or saligna. To span over 6m one would need to laminate to 114 x 400 at a cost of more than a steel I Beam. The steel was fabricated as per a drawing supplied by the client. 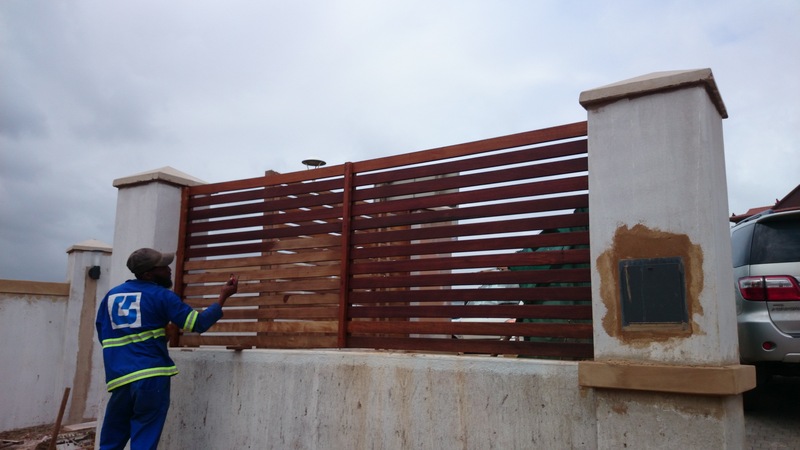 Because we were directly on the coast, we hot dip galvanised the steel and then installed it. It isn’t sufficient to electroplate and powder coat when one is this close to the coast. Once installed it was painted to match the charcoal grey colour of the rest of the steel on the building. Galvanised steel needs to be acid washed in order to remove the residue left after the galvanising process, dried thoroughly, then primed with a galvanising primer and then two coats of Velvaglo enamel. It will require periodic maintenance by re-coating it. The timber was cut to size and slotted in and attached to pre drilled and pre fixed tags on the main I beams. By pre drilling the holes for fixing eliminates drilling once galvanising has been done and thereby breaking the galvanising. The timber was left to grey naturally rather than sealing it with an oil. 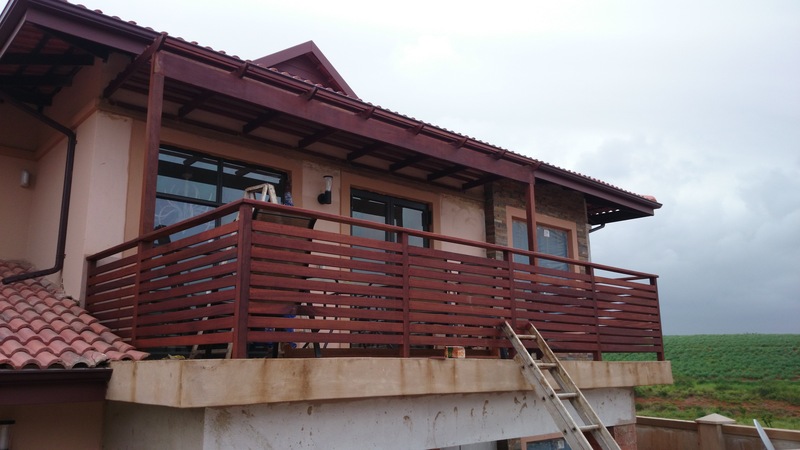 This won’t shorten the life span of the balau as balau contains natural resins and oils which protect it from both rot and insect infestation. Oiling it merely makes it look different. Some people prefer the oiled looked some prefer the natural grey / silver look. Leaving it to grey naturally also eliminates any maintenance issues going forward. If anything one would just pressure wash it from time to time. For a free no obligation quote contact us on 031 – 762 1795, or you can use the contact us form below. 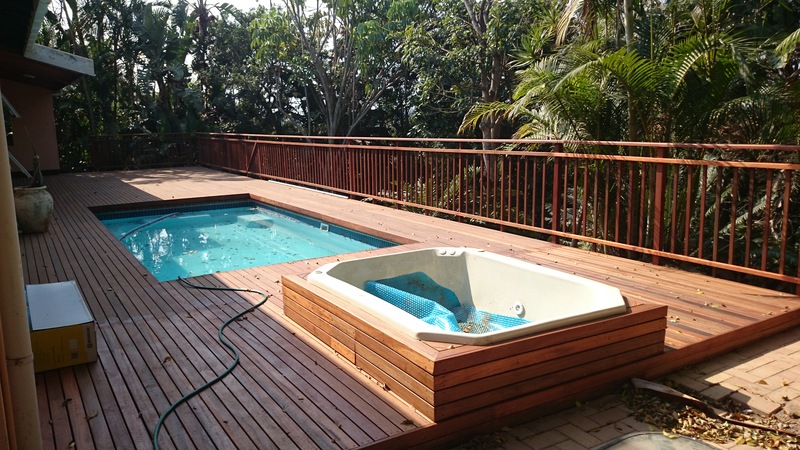 We can assist with all your outdoor wooden requirements as well as solid wooden floors. 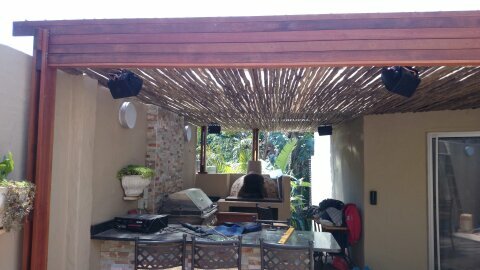 This was an interesting wooden pergola we built in Durban. 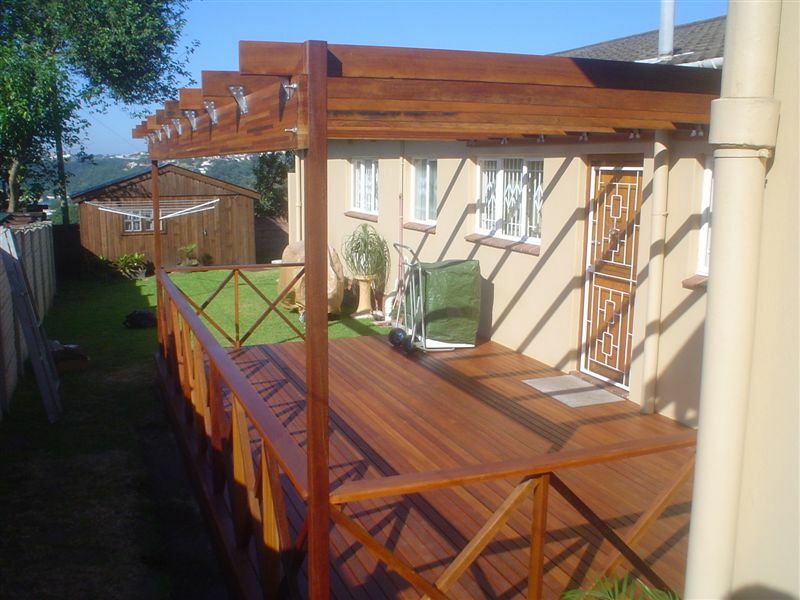 Most often pergolas are built using planed all round pieces (PAR) in the traditional pergola design which is vertical posts to support the structure and horizontal purlins of varying width and thickness to cover the top. Wooden pergolas don’t really offer any functional benefit as the rain still comes through and it offers limited sun protection depending on the density of the purlins above. This one however offered both protection from rain and sun yet still allowed light to come through. We built a structure using H3 CCA Pine which is guaranteed for 50 years against rot and insect infestation. On top of this we placed polycarbonate roof sheeting which we got from Modek. We used their bronze translucent one so that it breaks the sun yet still allows light through and of course offers protection from rain. It is best to use custom-made lengths so as to avoid any joins which would need to be waterproofed. It is not sufficient to overlap them in the direction of the fall. Because the angle or pitch of the roof sheeting is relatively gradual, the wind can blow the water backwards, up hill and through the joins. So it must be waterproofed to avoid any leaks. It is therefore much better to use one full length, the same length as the structure itself. Once our roof sheeting was on we installed thatching laths beneath with no gaps between them. These laths vary in diameter from 20mm to 35mm. So one needs to install them head to toe to limit the size of the gaps between them. This way they become quite dense so that one can’t see the structure or roof sheeting from beneath, but they still allow enough light through. In other jobs we have installed them with as little as half a laths diameter gap, but that still allows quite of lot of visible roof sheeting from beneath. It is therefore better to stack them tightly up against each other. 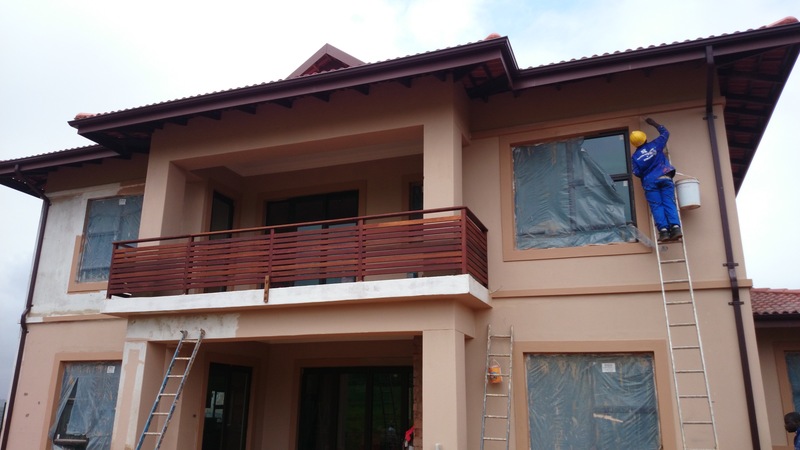 After these we clad the sides to cover or hide the pine we used with balau deck boards. The balau is a much better looking wood in terms of grain, colour and the straightness of each board. Balau is very stable and will tend to warp or cup less than pine over the years. So the appearance of the structure will remain flat and square a lot longer than pine. The final product was a rustic looking pergola which offered protection from sun and rain yet still allowed natural light through. The client later installed a sound system and lights beneath. 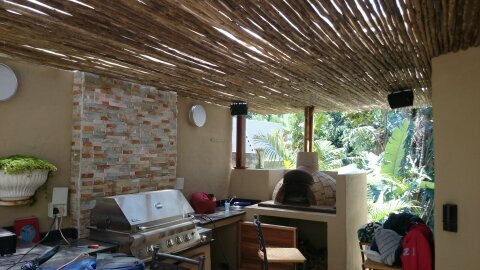 They had a pizza oven installed and a gas braai with a bar area which made for a very nice outdoors entertainment area which was protected from the elements. 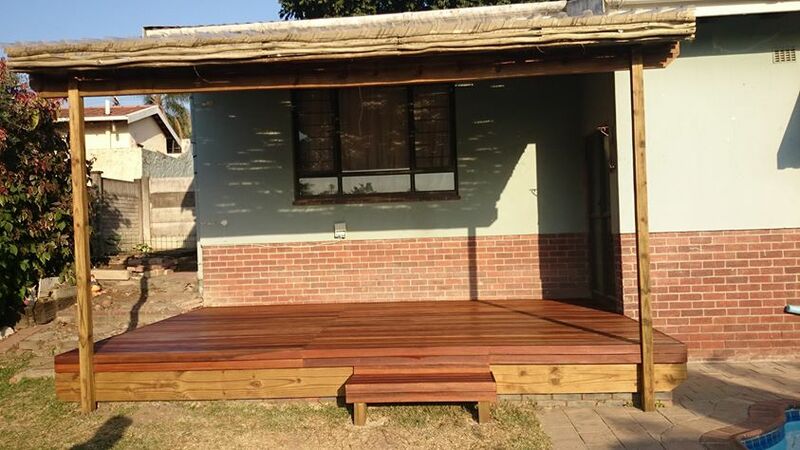 For a free no obligation quote on pergolas or other decking needs as well as floors or laminates please contact us on 031 – 762 1795 or you can use the form below to e-mail me. 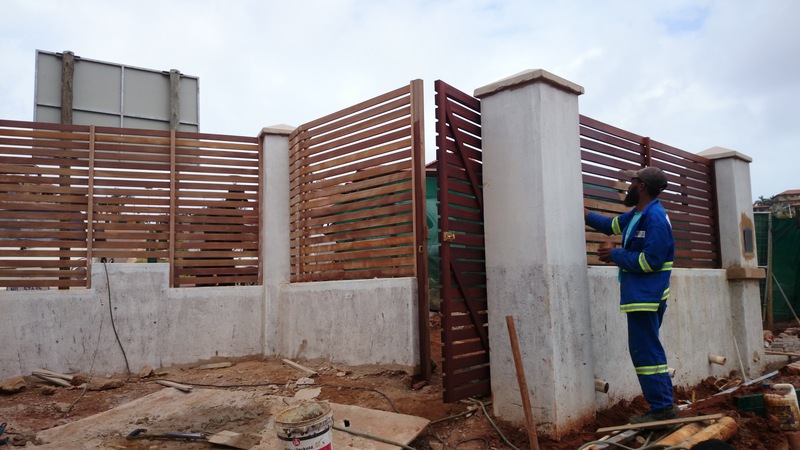 We were asked to quote on wooden screens, wooden pergolas, wooden decks and wooden gates on a new build in Prestondale, an area north of Umhlanga, at a development called Izinga Ridge. We originally quoted in about June 2013 and the work was awarded to us for s start date of about 1 November 2013. 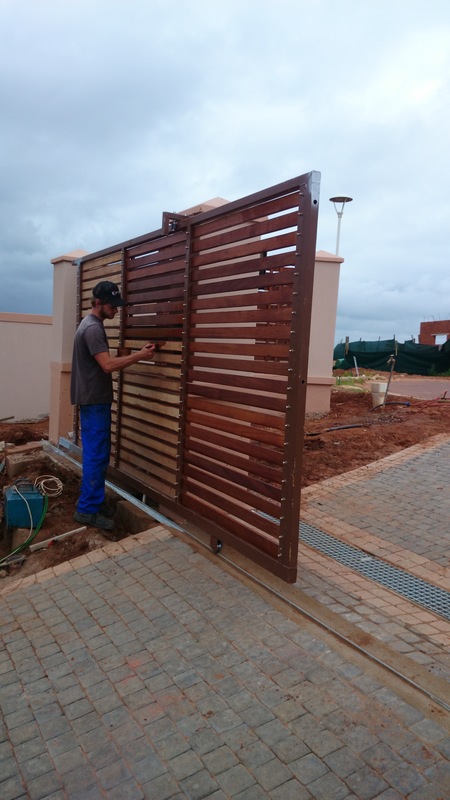 The job consisted of various screens between brick columns on the boundary wall, a pergola on an open balcony on the first floor, external and internal balustrades, garden gates, a driveway gate and a pool deck. 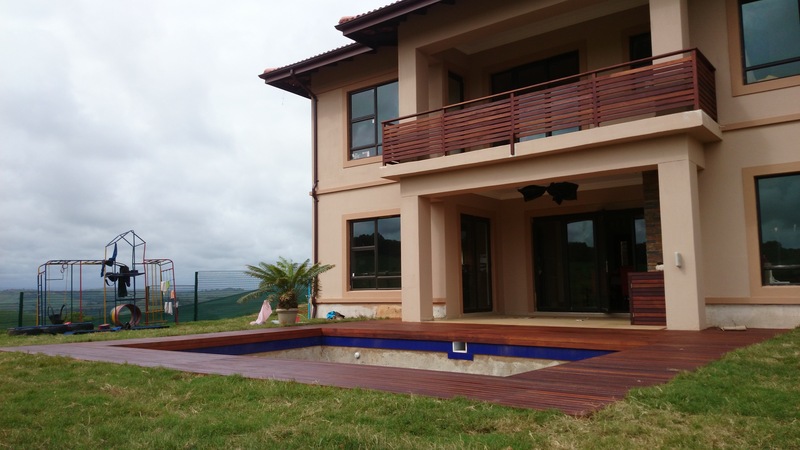 All the timber we used was balau hardwood with the exception of the substructure of the pool deck which was H3 and H4 CCA treated pine. In other articles you can read about how we have managed to keep our prices down by using this as a substructure whilst still being able to offer up to a 50 year guarantee on this treated timber. Most of the screens were pretty straight forward with balau cleats on the wall and then clad using a non reeded 19 x 68 deck board. We used non reeded so that both sides would look the same, but we did battle to find non reeded boards as most of the deck boards available are already reeded, or grooved on one side. There were two screens that proved a little more difficult as the wall we were attaching them to was angled. So the boards had to be cut at that angle and secured to each other whilst still remaining level and the join remaining plumb. The external balustrades were different to our normal vertical picket style balustrades as the client requested horizontal slats instead. Again we used non reeded deck boards for this with a normal post system. On each post we attached vertical cleats to accept the horizontal deck boards or slats. They were installed in line, or on top of the concrete slab, rather than being attached to the front of the concrete slab. The tiles had already gone down so we had to drill through the tiles without cracking them. We installed an “ankle” on the middle post to provide support which is attached to the vertical post and is then shaped to fit around the slab to attach again to the vertical of the concrete slab. This, in effect, allows the post to be attached to the outside but still allows the balustrade to sit on top of the slab. It is much neater but does require a bit more thought and re-enforcing. The pool deck was relatively simple as it was a low-level deck around the pool with a simple frame system using 38 x 114 joists and beams. Extra posts had to be concreted in as it wasn’t high enough to slot an under beam, or main beam, of 50 x 228 in. The driveway gate was fun. We had the steel made up in a design that would work well by cladding it with wood. We had to source long enough non reeded boards to run the full width of 4m. One cannot join boards in this type of gate unless there is a centre steel vertical support which would spoil the look of the gate a bit. We had run out of standard non reeded boards and so had all suppliers so we sourced a 20 x 140 board and ripped it in half, length ways, to arrive at two boards of 20 x 68. The pictures alongside show some work in progress and some completed work. It was an interesting but challenging job as there were many contractors on site all trying to work, and finish, before the handover of the house. The worst part of the job was fighting traffic from north Umhlanga to the freeway in both the morning and afternoon. 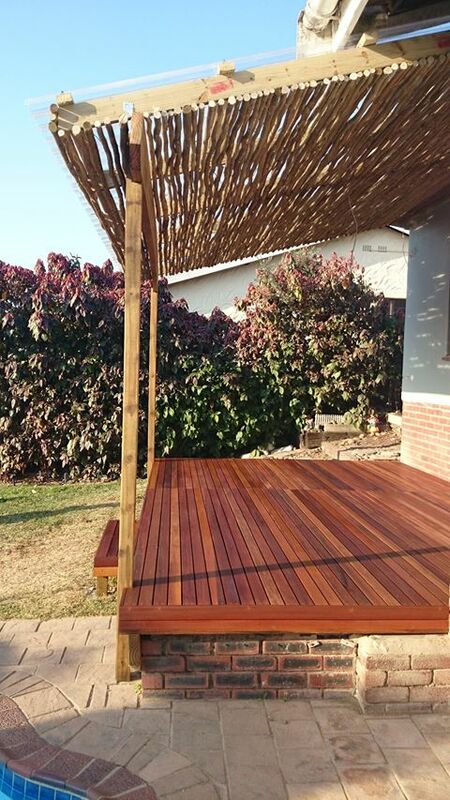 For a free, no obligation, quote on wooden decks, pergolas, garden gates, balustrades and all other outdoor timber work, please call us on 031 – 762 1795 or complete the form below.